ANNAPOLIS, MD – First Lady Yumi Hogan delivered congratulatory remarks and presented a Governor’s Citation at the Believe in Tomorrow Children’s House at Johns Hopkins 25th Anniversary on Saturday, November 17. 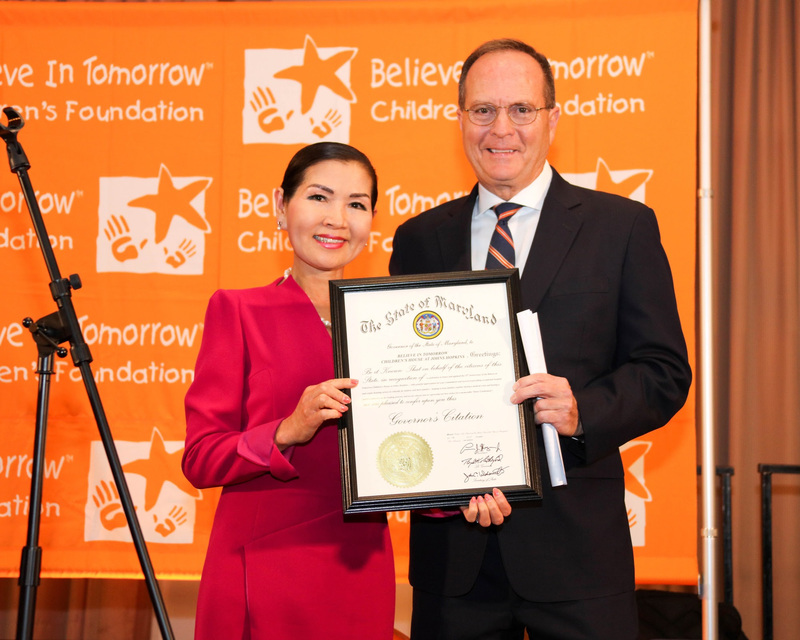 The Governor’s Citation was presented to Brian Morrison, Founder & CEO of Believe in Tomorrow in recognition of a celebration to honor and applaud the 25th anniversary of the Believe in Tomorrow Children’s House at Johns Hopkins. The foundation provides exceptional hospital and respite housing service to critically ill children and their families – helping to keep families together during a medical crisis and having a positive influence on the healing process. Over the last four years, the First Lady has visited children and families at multiple Children’s Houses, including the John Hopkins residence and the Ocean City home. She also had a chance to preview the Deep Creek facility a couple of years ago with the governor. Believe in Tomorrow Children’s Foundation also recognized 25 people, businesses, or organizations that have been instrumental to the success of The Children’s House at Johns Hopkins. Since 1982, Believe In Tomorrow has provided over 900,000 individual overnight accommodations, from every state in the U.S. and more than 82 countries worldwide. Their unique hospital housing and respite housing serve as a support system when families need it most. Believe In Tomorrow Children’s Foundation provides exceptional hospital and respite housing services to critically ill children and their families. Their programs bring comfort, hope, and joy to children and their families, enabling them to renew their spirits mentally and physically. For more information visit Believe in Tomorrow at https://believeintomorrow.org.